If you are a pedestrian and have been involved in an accident in Leicester, and it wasn’t your fault, then you could be eligible to claim for personal injury compensation. Our pedestrian accident solicitors work on a no win no fee* agreement when representing Leicestershire residents. If you would like to find out more then we offer a free phone consultation. Call today and tell us what happened to you. We will offer you some initial free advice, and if we feel you have a case can assign you a personal injury claims solicitor. You have the right of way. Call now to discuss your case. Most pedestrian injury claims occur when people are hit by cars, however, we can also help people in Leicester who have slipped and fell on Leicester pavements, or those hit by cyclists, buses, and other road users (even horse riders). Regardless of the circumstances, if the accident was not your fault, then you could be due pedestrian accident compensation. As a pedestrian and member of the public you are at very high risk of being injured in road traffic accidents. That’s why pedestrians should always be given the right of way by car drivers and other motorists. When you call us we will take as much information from you as possible to ascertain if blame can be apportioned to a third party such as a motorist, car driver, bus or coach driver, cyclist, or motorbike rider. If we feel there’s a claim then our solicitors will then ask you to supply more information after that point. We will need to prove that another person was responsible, which means it’s imperative that we collect any supporting evidence such as driver and witness details to the accident. If the police were in attendance we will also examine their reports as well as any records of medical treatment you have or are currently receiving. Being knocked over by a car is the most common claim that we help with in Leicester, but are well practised in all form of pedestrian accident compensation cases. 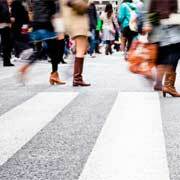 How Much Pedestrian Accident Compensation? Every single case is different, and compensation amounts will be settled and awarded depending on the severity of the injuries. We will seek to settle claims outside of court with the relevant third party insurance companies, and fight tirelessly to ensure that Leicester pedestrians, adults, and children get the due justice they deserve in cases such as this. Thankfully pedestrian road accidents are relatively rare in Leicester, but when they do happen they can have devastating consequences. For a no-nonsense, yet sympathetic approach to winning you the most compensation call today and speak with one of our accident advice specialists.